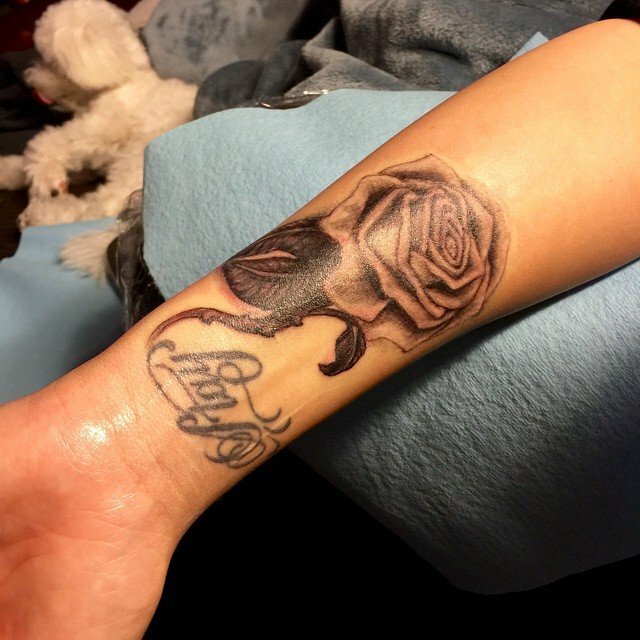 **Update: Demi has since added more roses to her arm cover-up tattoo, with a couple of leaves that extend onto the back of her left wrist, near her Roman numeral III wrist tat. 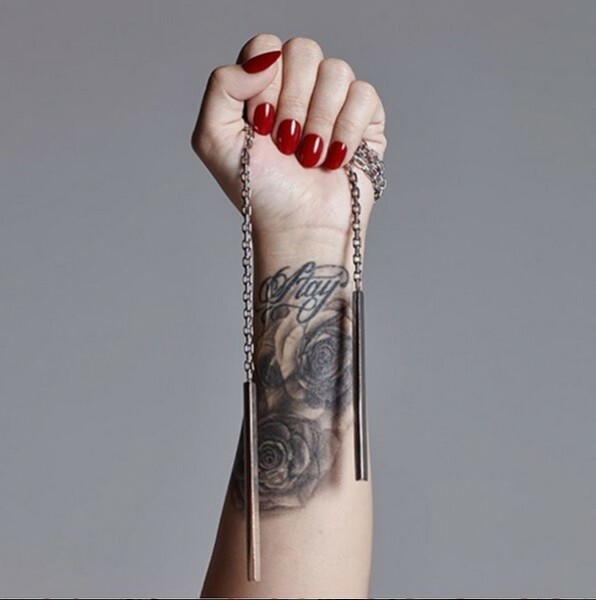 Inked just below the “Stay” part of her “Stay Strong” wrist tattoos, Demi Lovato’s new tattoo features a pretty large black and gray rose design, and was inked by the GEE’s Spot Tattoo Shop in North Hollywood, California. Demi Lovato teased a pic of her new tattoo on Instagram on April 1, but assured her followers in the comments section that the new ink was NOT an April Fool’s joke, writing, “Oh yeah…..Forgot to post this….It’s still a work in progress so I’ll insta when it’s done…” Apparently Demi had been planning on covering up the red lip print tattoo on her wrist, and what better replacement tat than a rose, which can symbolize anything from love to beauty to balance, promise or hope. This tattoo meaning definitely ties into Demi Lovato’s outlook on life, which is all about being positive, strong, and beautiful, inside and out. Now that Demi Lovato has finally revealed her new arm tattoo, we’re glad to see that the ink covers up the old lips tattoo she had done in 2011…in the back of a tour bus at Warped Tour. According to Demi, her lips tattoo matched the same tats her three best friends got at the same time, of each other’s lip prints. Demi Lovato’s wrist tattoo apparently featured the puckered-up pout of bestie Ivey Ensley, and this is what she had to say about it at the time: “I got like a kiss mark, and it’s just like a friendship tattoo and also it kinda reminds me not to take myself too seriously. 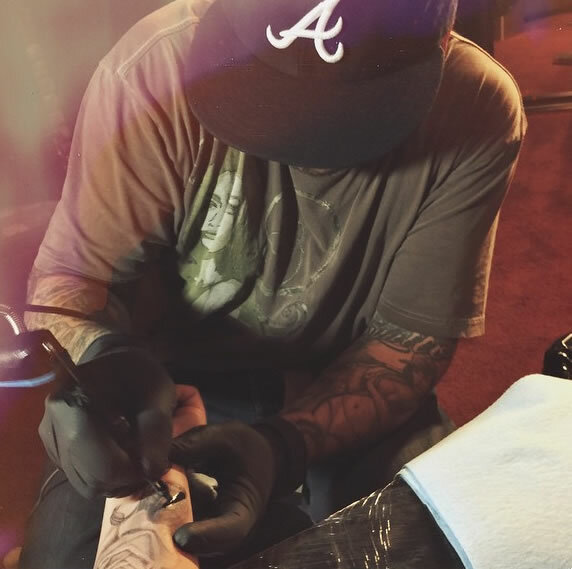 I got like a fun tattoo rather than all these other ones that are serious.” We have to admit, unlike some of Demi’s newer tattoos, which we love, we are happy to see the end of her weird lip print tattoo, and even happier to see her awesome new rose ink!